Today, the farmers who work the verdant fields of Buxton, a small farming community in southern Ontario about an hour’s drive from Detroit, are mostly white. But a visitor in the 1850s would have found its neat rows of corn and golden wheat being tended by black farmers—free and formerly enslaved Americans who had fled the United States. Their journeys are being echoed today, a reminder of a longstanding truth: that for persecuted Americans, Canada has long been a refuge. In February, soon after Donald Trump assumed office, stories began surfacing of asylum seekers and undocumented immigrants crossing the border from the United States and into Canada. For many, their first home in the U.S. had been a detention center; now, with a man in office who promised to swiftly deport them, they had decided to take their chances and flee north. They did this on foot, walking through winter fields in North Dakota and Minnesota and Vermont and New York, at times blanketed up to their waists in snow and losing fingers to frostbite; they waded through the mud of rivers; they made their way across bridges, guided by the flashing lights of TV towers and wind turbines that others had told them would mean they had reached safety. Still more, with the help of advocacy organizations and an increasing number of churches that are part of a new sanctuary movement, have presented themselves at official border crossings, hoping that in Canada, they can find the safety and peace of mind the United States has denied them. As the weather has warmed, those numbers have increased—from the beginning of the year up through June, according to the latest numbers released by the Canadian government, more than 4,000 asylum seekers have been found crossing the border by the Royal Canadian Mounted Police. An even greater number have presented themselves at border checkpoints to claim asylum. Perhaps inevitably, this flow of people and the network of churches and advocacy groups that have come to asylum seekers’ aid has been dubbed the new Underground Railroad. While the brutality of chattel slavery can’t be compared to our modern-day immigration system without uncomfortably stretching the boundaries of truth, it’s still a useful parallel. For tens of thousands of enslaved black Americans who sought freedom in the decades before the Civil War, the last stop on the Underground Railroad wasn’t the nominally free states in the north, but Canada. 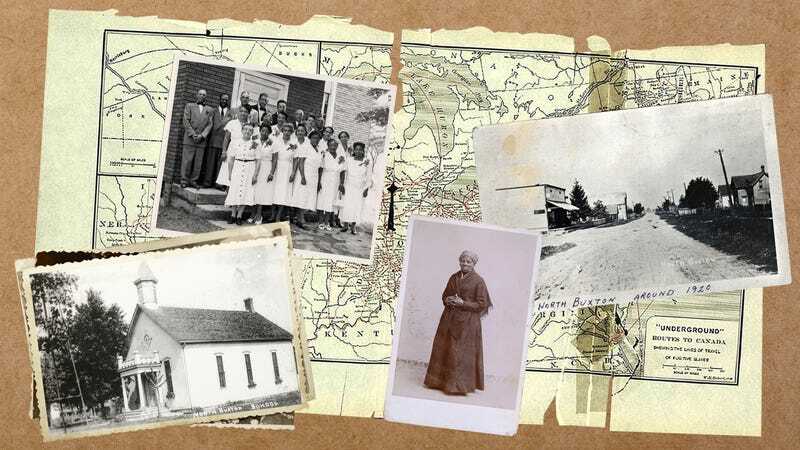 Aided by black and white individuals and organizations on both sides of the border, black refugees settled throughout what is now southern Ontario and what then was known as Canada West or Upper Canada, at the time still a colony of Great Britain. We do not tend to think of these people today as refugees, but they were refugees in all senses of the word, and were described as such in the literature of the time, many coming with only the clothes on their backs. Today, their descendants keep the memory of Canada’s Underground Railroad alive in small museums scattered throughout southern Ontario. At the end of June, I visited the descendents of these refugees, the stories of their modern-day counterparts crowding my head. In Chatham, a small town in rural Ontario, I met Dorothy Wright, a diminutive, silver-haired woman in her seventies. Wright is on the board of the Chatham-Kent Black Historical Society, which runs the Black Mecca Museum, located in a corner of a local community center. I had spent a half hour at the cramped, one-room museum before I met up with Wright, for a tour of black Chatham. One of the stops was the church where, in 1858, John Brown spoke before a crowd of Chatham’s black residents, looking to garner support (and men) for his raid on Harper’s Ferry. Another stop was simply a block she remembered was once full of black families, whose names she called out as we walked past their former homes. Was Chatham a mecca for black people? I asked Wright, referring to the museum’s name. She laughed, and then offered up one example dispelling that assumption: Black students were barred from attending schools with white children, and when black refugees then built a separate schoolhouse, it was burned down. Black Americans started fleeing to Canada in growing numbers shortly after the War of 1812; after Great Britain abolished slavery in its colonies in 1834, that migration increased. But it was the signing of the Fugitive Slave Act of 1850 that swelled the ranks of freedom seekers into the tens of thousands. Abolitionist and black-owned newspapers urged enslaved Americans to find refuge in Canada. “Let the slave only reach Canada and he shall be free,” proclaimed one newspaper in Boston. It was the Fugitive Slave Act that compelled Harriet Tubman across the border, where she lived for years in St. Catharine’s and where she brought many of the people she rescued from slavery, including her own parents. “I wouldn’t trust Uncle Sam with my people no longer,” she said in an interview from 1858 with a local newspaper. “I brought them all clear off to Canada.” Popular accounts of those who had settled in Canada circulated widely in the states, promoting the idea of Canada as a promised land for black Americans, as did the publication of Harriet Beecher Stowe’s novel Uncle Tom’s Cabin. According to the historian Eric Foner, the 1851 census had counted fewer than 5,000 black residents living in what is now Ontario. By 1860, Foner noted, the population had grown to more than 20,000, many of them fugitive slaves who had crossed into Canada through either upstate New York or Detroit. But if abolitionists and black Americans, both free and enslaved, saw Canada as a “Canaan of the Colored people,” the refugees did not always find a warm welcome. Anti-black racism knew no borders. “[F]ugitive slaves are by no means a desirable class of immigrants for Canada, especially when they come in large numbers,” warned a Toronto-based newspaper in 1855. Still, throughout southern Ontario, black residents built thriving communities for themselves, a history celebrated at the Black Mecca Museum. Chatham, which had one of the largest black populations in Canada and entire city blocks filled with black-owned businesses, was described as a “coloured man’s Paris” by one of its residents, a black doctor who had moved to the town after being forced out of Harvard Medical School by some of its white students. And a few miles south of Chatham was perhaps the best-known of all of the black communities in Canada, a black-only settlement known as the Elgin Settlement or more simply as Buxton. It was founded in 1849 by Reverend William King, an Irish-born minister who had moved to the United States in 1833, where he married into a slave-owning family. When King, an ardent abolitionist, inherited his father-in-law’s slaves upon his death, he devised a plan to both free his slaves and create a self-reliant black community in Canada. Buxton, spread out over 9,000 acres, was the result. No white people could buy into Buxton; its land, sold in 50-acre parcels, could only be bought by black families. Buxton is still a farming community, all fields of verdant corn and golden wheat, though today its farmers are mostly white. A few black families remain, and one of them is that of Shannon Prince, the curator of the Buxton National Historic Site and Museum. Prince’s family has lived in Buxton since 1852, and her brothers still farm the land that was bought by their ancestors. “All of this land at one time was totally black-owned and -operated,” Shannon Prince told me as we stood on the tidy grounds of the museum. At its height, Buxton included a sawmill, a pearl ash factory, and numerous stores and businesses. It’s for this reason that, in 1972, Ebony magazine described Buxton as “the first Black Power town” in North America. Today, those businesses and community institutions are gone, as are many of the black families who once called Chatham and Buxton home. With the end of the Civil War in 1865 and lured by the (largely false) promise of Reconstruction, the majority of refugees and their families left Canada to return to the United States. Organizations on both sides of the border that had helped refugees reach safety ended their operations. Farms were sold, businesses closed, church pews emptied. In the 1870s, the association that managed the Buxton Settlement was formally shuttered. The site of the historically black British Methodist Episcopal church in Chatham, which was demolished in 1989, is now a public garden ringed with flowers and has been graced with the name Freedom Park. There, I asked Dorothy Wright what lesson people should take from the story of black refugees in Canada. One can easily draw a thread from the Underground Railroad of the mid-1800s to the sanctuary movement of the 1980s that assisted Central Americans fleeing war, and now to today’s new sanctuary movement offering aid to asylum seekers and undocumented immigrants. “I see this very much as being part of Harriet Tubman’s movement, and being part of that history of people being willing to risk and dare to do the right thing,” Reverend Justo Gonzalez II told me. Gonzalez is the pastor of Pilgrim - St. Luke’s United Church of Christ in Buffalo, New York. In January, its congregation voted to officially declared it a sanctuary church, after a series of ICE raids in the city spurred them to action. Now, on any given night, the church houses almost a dozen people. Most of them are undocumented immigrants who have lived in the U.S. for years, from the Central American countries of El Salvador, Guatemala, and Honduras, as well as Colombia and Venezuela. Some have traveled from as far away as Texas, California, and Georgia; all of them are hoping to make their way to Canada. News about the church is spreading. Recently, a family of six—a wife and husband and their four children—had shown up on their doorstep unannounced, coming all the way from Oklahoma. He is now having conversations with other churches, on both sides of the border, about helping move people from one location to the next. “It isn’t an easy place to be,” Gonzalez said of Canada. “They’re certainly more free. They don’t have to worry about immigration picking them up off the streets. But you’re starting a brand new life, and you’re giving up everything.” Resentment within Canada, too, is growing: Almost half of all Canadians surveyed in a Reuters poll from March want to deport people who are caught crossing the border from the U.S.
Esther Wang is a writer based in New York City. Follow her on Twitter @estherxlwang.